CleanGuidePro is a software company that offers a web-based Janitorial Bidding application that's used in the creation of Janitorial, Construction Clean, Apartment Move Out and Residential cleaning bids. Our Janitorial Bidware system guides you through a 7-Step Bid Creation Process that results in a professional, ready to deliver cleaning proposal file (in PDF format). By the way, a PDF (which stands for "Portable Document Format") is the de facto standard file format for printable documents on the web; It captures all the elements of a printed document in an electronic image that you can view, navigate, print, save or e-mail. Check out a Sample Bid. The Bidware also computes a starting price for your Bid (by setting a Profit Margin that is based on the type of bid that you're creating). You can, of course, adjust this as you see fit. Note: You'll find that two of the seven bid creation steps are optional, but they provide excellent ways for you to earn more profit on a bid. Specifically, the optional Specialty Work step contains over a dozen Specialty Work items that you can elect to include on your bid (such as floor waxing, carpet cleaning, pressure washing, day-porter, etc). The optional Supply Sales step enables you to offer consumable supplies (such as roll towels, toilet paper, can liners, etc.) in your bid. For more info: The CleanGuidePro home page highlights some of the system's main features and also includes screenshots. CleanGuidePro runs in the cloud on our secure servers, so there's nothing to install... It's available anywhere you have an internet connection. Windows XP note: If your PC is running a version of the Windows operating system that is no longer supported by Microsoft (such as Windows XP), then some of the buttons, functions and/or pop-up boxes within our modern application may not execute properly. Therefore, CleanGuidePro Janitorial Bidware is not recommended for (nor supported on) obsolete or non-supported computer operating systems. Good to know: For consumers, there are many advantages to using online software (a.k.a. SaaS - Software as a Service), the primary ones being no software installations/updates and 24/7 access from any PC, Mac or tablet/iPad (as opposed to being installed on a single computer in a single location). Likewise, for developers, a web-based browser platform (versus the old computer hardware based platform) is much more stable and manageable, with everyone operating on the same release of the system. The system is designed to be intuitive and our customer feedback confirms this. Just 7 straightforward steps to a winning bid! Suggestion for getting started: The Support team has noticed that the short Video Tutorials are particularly useful as new trial members navigate the Bid Creation process for the first time. If you'll spend a few minutes reviewing the appropriate video for each step as you create your first bid, your proposal creation speed will sky rocket. How can CleanGuidePro help me grow my business? To win new business, you've got to start by making a great impression with a sleek, professional cleaning proposal. And the "math" behind that proposal - (which emphasizes that accurate cost determination leads to a fair Profit Margin) - needs to be spot on. And that's where CleanGuidePro shines! How does CleanguidePro determine an accurate cleaning production rate? The Cleaning Production Rate for a particular facility (which determines how long it will take to clean a building) is based on industry standards that have been tweaked and refined based on our founder's 25+ years of winning bids in the janitorial industry. How does the system arrive at a suggested bid price? Determine the cleaning production rate (as expressed in cleaning hours) for a particular type of building (factoring in such variables as industry standards, square footage, traffic and floor type to name just a few). Determine your costs associated with the system-generated cleaning hours (i.e. your location-specific wages, additional payroll costs, chemical, and other costs). We can't emphasize this enough; Business 101 teaches us that no one can profitably bid a job unless they first determine how much it's going to cost to do it! Absolutely! For starters, consider the system output - the cleaning proposal: You can include, exclude or rearrange any of our standard janitorial proposal section templates. Or create your own. Or include photos and images on any page and/or upload additional supporting documents (for example, Proof of Insurance). Of course, you also get to store your logo, references, experience and/or mission statement in the system which can then be pulled into any page you desire (if you don't prefer our default arrangement). During the bid creation process, you can also tweak our system generated cleaning specs or add your own. In the system preferences, you can override our default settings for profit margin as well as specific costs (e.g. additional payroll cost percentages). Or just change the system percentages for a specific bid. And here's a customer favorite: On the Bid Workloading and Pricing screen, you can change your production rate (or cleaning hours) and easily play out "what if scenarios" such as: If I increase my production rate and adjust my employee wages up or down, how does that effect my total monthly cost to clean this building?" Of course, companies outside of the United States can override the default currency ($ - dollars) as well as set their preferred unit of measure (square feet or square meters). Can I e-mail a completed Proposal? Of course! In addition to e-mailing (via your browser's PDF Reader), you can also print and/or save proposals to your computer (for later viewing/printing/e-mailing). Was it designed for start-ups or established companies? Both! The system architecture focuses on the janitorial bidding process, which is independent of company size. Our customer base consists of every type of operation, from one person startups to established companies with hundreds of employees. After the free trial, what's the monthly cost? CleanGuidePro Janitorial Bidware offers a 30 day free trial, which you can sign up for on our Trial page. If you don't love it, cancel anytime before the 30 days have expired and you won't be billed. (By the way, we'll send you two e-mail reminders - at 7 days and again at 3 days - before the trial ends). For your reference, our no-hassle (red) cancellation button is located on the Member Subscription screen, but we really think that you're going to find our bidware to be an indispensable tool; There's nothing like this all-inclusive bidding system out there! After the trial, our software bills at $24.95 USD per month, until you cancel. CleanGuidePro Janitorial Bidware is very competitively priced - unmatched actually - and our customer feedback is overwhelmingly positive regarding value for price. For about the cost of having a large pizza delivered, there is no limit on the amount of bids that you can create every month... And of course, the system pays for itself as you win those bids! Regarding the trial: Some folks have asked us, "Why do you require a credit card for a free trial"? Well, when CleanGuidePro was launched in January of 2013, we didn't initially ask for a card upfront. And then we quickly learned why most companies do... While 99.99% of our system users are wonderful, we've found that requiring a card - even though we don't charge it at any time during the trial - pre-qualifies our customer base and helps protects us from fraudulent use of our system and pirating of our content. It also makes for a seamless transition from trial to paid status for our customers. I didn't receive my automated Trial Activation e-mail! It might just be sitting in your Spam or Junk folder. (That's the case about 25% of the time.) Search for an e-mail with the subject "CleanGuidePro - Trial Membership Activation". Side note: Some mail clients treat all automated e-mails - such as trial activation e-mails - like spam, and immediately reroute them to your Spam/Junk folder. This is especially true for free e-mail accounts - (we're looking at you Yahoo!) - as opposed to YourName@YourBusinessDomain.com. Look for the onscreen Confirmation message: If a form submission is successful, you'll see the registration confirmation message (below) at the top of the screen. No messages? If you didn’t see any Confirmation (or Error) message on the registration screen, then your information didn’t go anywhere as it never left your browser. This can happen when the form’s submit button was either (a) not clicked or (b) not acknowledged by your computer’s browser. There may be a device incompatibility issue. Did you attempt to register from a mobile phone? Or from an old PC that's running the (now unsupported) Windows XP operating system? See the Technical Requirements section of this FAQ. 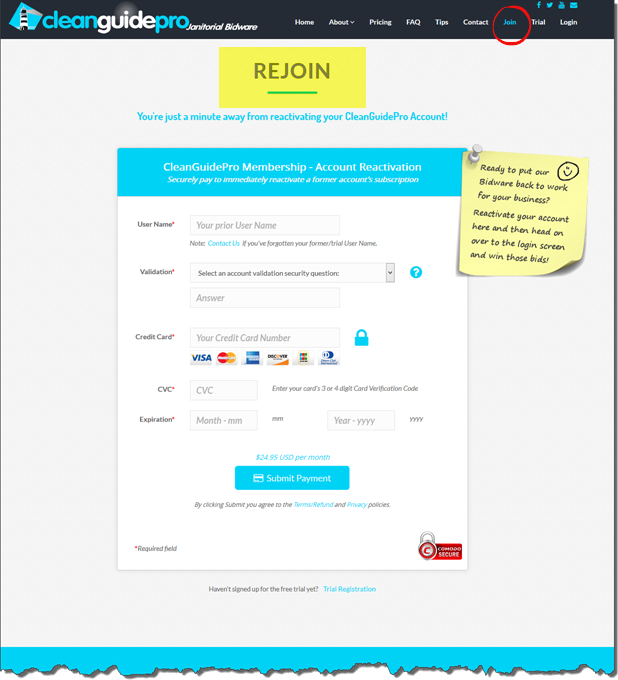 Have you clicked on the "Activation Link" in your "CleanGuidePro - Trial Membership Activation" e-mail yet? Note: If you didn't receive your Trial Activation e-mail, please see the FAQ section immediately preceding this one. How do I cancel my membership (or trial membership)? To cancel, click the red Cancel Icon - - located to the (top) right of the My Subscription Info section. A pop-up dialog box will then appear that displays a large Cancellation Confirmation Button (at bottom, that you must click) as well as details on when the cancellation will take effect. Here's how you'll know that your account has been successfully "Set to Cancel": After canceling (and closing the Cancellation Pop-Up box), your My Subscription Info Status should change from "Active" (or "Trialing") to "Pending Cancellation on a specified date". In addition, you should immediately receive a Cancellation follow-up e-mail from us. Finally, you'll receive a Cancellation Confirmation e-mail on the designated cancel date. How can I rejoin after I've canceled my membership (or trial membership)? All you'll need is your prior User Name - (contact us if you've forgotten it) - plus your credit card number (along with its expiration date and Card Verification Code). Note: Since account User Names can be very similar, you'll also be asked to select and answer a security question to ensure that you're reactivating the desired account. After filling out the short form and clicking the Submit Payment button, your monthly subscription will immediately be reactivated (and your card will be billed $24.95). You can then go to the website's Login screen and sign into your newly reactivated account. 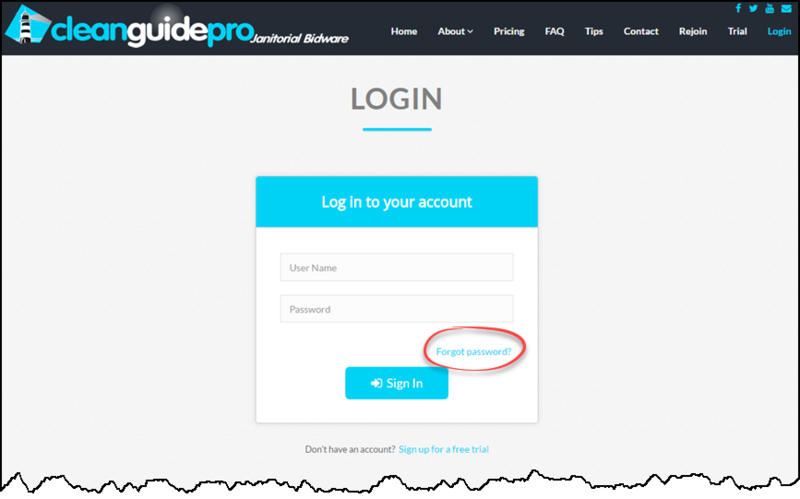 To reset your password, go to the CleanGuidePro Login screen and click the "Forgot Password" link (located above the Sign-in button). The Reset Password screen: You'll then be redirected to the Reset Password screen where you'll be prompted to enter your User Name. Upon submission, a temporary password will be e-mailed to the e-mail address that is on file for your User Name. Change your password after logging in: Once you're logged into the CleanGuidePro application, you can change your temporary password on the Member Password screen. Support Times: CleanGuidePro Support Hours are 9am - 9pm (U.S. Eastern time), Monday - Friday. Regarding telephone support: We do not generally provide support over the phone (unless we've set an appointment for a telephone tutorial with you). However, we do follow-up via telephone as needed. 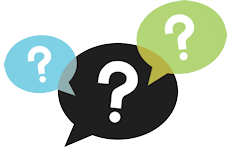 Frequently Asked Questions: In addition to this general FAQ page on our public website, we also maintain a more application-specific one within the Bidware. We keep it in-house: A knowledgeable CleanGuidepro employee (or one of the company founders) will answer your inquiry. We do not outsource our support or employ unqualified support staff.